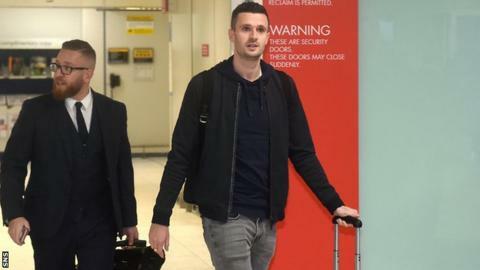 Rangers have signed Brighton's former Motherwell winger Jamie Murphy on loan until the end of the season. The deal for the 28-year-old Scot "will become permanent" in the summer when Rangers pay a "guaranteed fixed fee" according to the Ibrox club's website. Murphy made 35 league appearances as Brighton earned promotion from the Championship last season. "Jamie's a fantastic professional, a great lad, and has a desire to play," Brighton boss Chris Hughton said. "While we were in no hurry to see him leave, we do understand his desire to play for his boyhood team and one of the biggest clubs in Scotland. "He's been excellent for the club, ever since we signed him from Sheffield United, and wrote himself into club folklore as a crucial part of our promotion-winning side last season. "On behalf of all at the club, I'd like to thank Jamie for his efforts and achievements during his time here and wish him the very best for the future." Murphy, who played for Motherwell before moving to Sheffield United in 2013, joined the Seagulls in 2015. Despite his prominent role in their promotion to the Premier League, Murphy has made only four league appearances this season, three as a substitute. He will now fly to Florida to join up with the rest of the Rangers squad on their winter break. After the announcement in the early hours of Sunday morning, Murphy wrote on Twitter: "Wore the shirt many times as a kid but the chance to put it on for real is something special. Will always be worn with pride. Thank you all for the support."